Life can be wonderful at times like what happened last night in our temporary quarters in the Irving Ludmer Building at the top of Peel Street on McGill’s campus. I was sitting in my little corner section when I noticed from the corner of my vision this pretty girl come into our lab with a real beautiful smile announcing,”There’s a Christmas party downstairs for the building-free food and drinks-come on down to room 138 to celebrate!” So we did. It was one of those informal affairs with a bunch of people who work around us in offices but we don’t know each other. We are in dental/bone/heart/brain research plus we are here temporarily as a new sprinkler system gets finished in our old building- the former library of medicine at the Strathcona Anatomy Dentistry Building. Back when they constructed this building over a century ago they didn’t know that asbestos, which they added to every single brick in the building as a binding agent, was so dangerous. So when any work involving the structure is involved, like installing a new fire suppression water sprinkler system, they have to isolate the work with full contamination protocols. So basically we were kicked out of our offices 3 months ago-hence our imposed exodus to Ludmer. I walk up to this petite lady dressed in black to thank her for the Christmas party invitation. I start talking shop to her, explaining what we are trying to do with opening a different dialogue with concussions. Then she introduces herself as Mimi Israel, she explains she studies anorexia. I gulped. Many years ago for a few months I was real heavy into anorexia reading about the topic for a few months. In a previous blog I had described my encounter with Dr Duncan Stewart using anorexia as a way to view heart changes with dietary suppression. I mentioned Dr Stewart after she had said some key words like: osteoporosis, heart pacing anomalies, brain control. Then she mentioned she knew Dr Stewart, “He’s my era.” ‘Wow,’ I said to myself, ‘ we’re on common ground here, it’s the neurocardiac bone axis of control.’ So I told her I had a great new German EKG test to evaluate cardiac changes maybe with her anorexic patients that I had only unraveled in the previous week. Would she like to collaborate with us perhaps with Dr Chris Andersen and his awesome GE bone density scanner? Certainly looks like a potential joint project could be hatched. Dr. Andersen studies bariatric surgery patients. These are very, very big people like 400 pounds big. The stresses on their body with such a massive weight gain is huge, their hearts have to absorb this swirling abundant load, their bones have to carry the weight, it’s a very serious problem. Dr Andersen scans their entire bodies as they lose over relatively short time periods, sometimes over a hundred, sometimes as much as two hundred pounds. This is a significant change to their bone structure-hence his acute interest. Dr Ross Andersen has a Canada Chair to study this disease, he’s a very capable clinical researcher. Then it dawned on me.’Mon Dieux! These two patient groups, anorexic and bariatric are almost identical, they both lose a ton of weight. ‘ They both have heart arrhythmias, they both are osteoporotic, they must be experiencing the same pivoting decoupling in their brains, and our little group in dentistry knows where to look ! ‘It’s the brain-heart-bone axis dilemma.’ When I mentioned this term to Dr Israel she looked at me, her eyes sparkling, ” I like how you describe that, where did you get that term?” “It’s mine it’s what we do too, we’re on the same boat – we have to talk,” I blurted out. So lets talk a little about anorexia, again…..with a different spin- with Taku Tsubo cardiomyopathy from Dr Watson’s point of view. Please bear with me! Check one of my previous blogs on Taku Tsubo, if you will recall the little drawing in the middle of this ultrasound image is the outline of an octopus trap, which is takutsubo in Japanese. 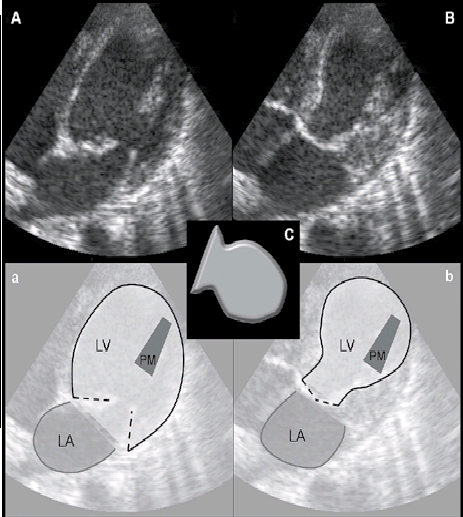 So the image is with the upper portion (apical in medical lingo) that is as if the heart is squeezed, that’s the LV or left ventricle on the right. LA is the left atrium, by the way the image is oriented upside down to our usual frame of viewing the heart. Taku Tsubo usually affects postmenopausal women with presentation to an emergency room as acute myocardial infarction complaining of chest pain. Upon EKG examination- ST elevation and/or T-wave inversion plus a rise in cardiac enzymes (troponin) is the usual reports from the literature. The Sherlock Holmes puzzler is: no coronary event is found. So who or what done it? The extreme risk and acute symptoms of Taku Tsubo can become very severe, cascading into cardiogenic shock, involving ventricular arrhythmia’s precipitating to death. However, prognosis is usually quite favorable with a full recovery of left ventricular function in most cases. Holmes settled into his favorite chair, the ring of pipe smoke parked, slowly spiraling over his head. For a few minutes he sat there, allowing his grey matter to dwell, a familiar pattern spinning inside of his head. Always looking where no one looked. He broke his self imposed silence.